In 1981, I am with a group of automobile people in Baton Rouge, Louisiana to preview the newly designed Chevrolet Camaro. It hasn’t come out yet and we are seeing it for the first time, on film in a big screen. Because of industrial spies, everything is tightly supervised. When the film starts and the Camaro is viewed, the whole audience applauds. It was a beautiful automobile, so I suppose the reaction was ok; but the meal we enjoyed, now that was laudable. Nobody applauded, but we could have. Among the items served, a Cassoulet was astounding. A gent seated next to me said “these beans are wonderful, eh?” He was right. The sausage, the pork, the beans, all cooked with confit made a delicious dish. I forgot what else we had that day, but not that dish of beans and meat. Sometimes when you order it, it is too salty; one time mine had a greasy taste. 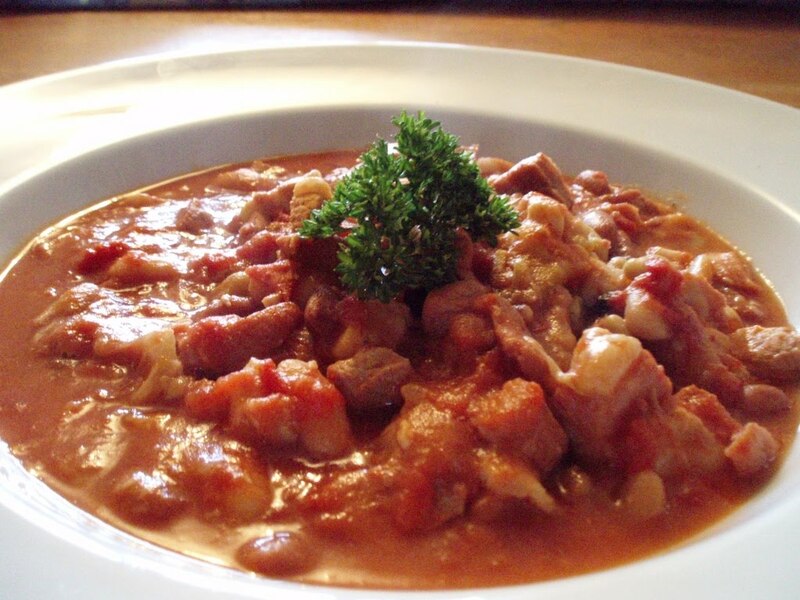 Cassoulet is not popularly made at home because it is complicated, and you can’t always get the traditional groceries. I went to the library and looked it up, and then proceeded to refine it. I ended up with a Cassoulet that’s simple yet tasty. This is a delightful classic and serves about 8 diners. If you want to, you can make it on a weekend and freeze portions for later in the week. You could substitute other meats as well. Rinse and sort the beans. Soak overnight or quick- soak by covering with water, bringing to a boil and let sit for one hour. Then drain and throw out soak water. Put all the above ingredients in a big pot or a pressure cooker. Either cook for one hour in regular pot, or 5 minutes in pressure cooker. When done, set aside or quick -release the pressure cooker. Remove one cup of beans. If not soft enough, boil until soft and mash them. Return to pot. (The beans can still be a little firm as they are going into the oven. The mashed beans are to give body to the casserole). Fry bacon crisply, remove and crumple it and save the drippings. Don’t crowd the skillet, fry up the meats, some at a time, until all are browned. Deglaze the skillet with the wine, place half the beans in a Dutch oven and place meats over, including crumpled bacon, and then cover that with remaining beans. Cover the Dutch oven, put into the oven and bake for 1 hour, check midway to make sure there is enough liquid, if not add a little water. When serving, you may want to cut the chops up so there is some for all. Try cooking these beans and meats, they’re absolutely scrumptious.